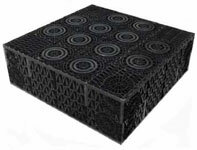 Aluline AQUAVOID is a stormwater storage unit which has been designed for rapid assembly of an underground structure as part of a Stormwater Management System. Developed specifically to meet the needs of sustainable urban drainage systems, Aluline AQUAVOID allows stormwater run-off to be stored temporarily and then released either through infiltration into the sub-strata or released as part of an attenuation scheme designed to reduce the impact of flow on adjacent sewer systems. Aluline AQUAVOID is an extremely strong polypropylene water permeable modular unit with a volume of one third of a cubic metre (1m x 1m plan by 1/3m height) which, through the use of interconnecting clips, enables rapid construction of both large and small storage capacities whilst retaining the flexibility required by many schemes. Constructed of wine box style interconnecting panels together with integral pipes Aluline AQUAVOID is capable of withstanding very high loadings making it the ideal choice for retaining stormwater for SUDS applications. Aluline AQUAVOID is available in three main configurations: Aluline AQUAVOID STANDARD, with a very high load bearing capability from 600kN/m2, designed to meet most requirements; Aluline AQUAVOID LITE, with a lower load bearing capability of 200kN/m2, designed for domestic & developer use; Aluline AQUAVOID BESPOKE, designed to specific requirements for extra heavy duty use. 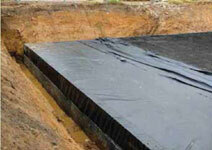 Aluline AQUAVOID is ideal for bulk storage of stormwater in both attenuation and infiltration schemes. Buried at least 0.5m below the surface the extreme traffic loading capability makes it ideal for amenity areas and even under car parks and HGV areas.